“If you’re looking for a new favorite game for your mobile device, my money says that World of Tanks is it.” Read our full review to find out why. It’s probably not fair to you to read my review of World of Tanks: Blitz for iOS. Why? Because I thought Wargaming’s World of Tanks for Xbox and PC was awesome. Not awesome like COD awesome, or like (old-school Atari) Combat awesome; like I’ve-never-played-a-game-quite-like-this-before awesome. On the Xbox, while controls don’t always spot on, and while the tanks are…well, tanky–slow, clunky and easily killed–the game offers quick turnaround on both consoles and PCs, and the arenas are really genuine. The mobile app, I’m happy to say, was just a hint more intuitive and easy-to-master, making World of Tanks one of my new favorite mobile games. When I first reviewed World of Tanks, I wasn’t expecting much; I was pleasantly surprised to find that this was a next level freemium game. Drawing on tanks from World Wars I and II, the combat vehicles in World of Tanks are historically accurate. They are not needlessly beautified or enhanced, they have mobility limitations, and they don’t do anything that you wouldn’t expect a tank to do. The concept behind WOT sounds simple enough: you crawl to destinations like the blocky, oversized lawn mower that you are, hide behind objects, and take shots at enemies who move just as slowly as you do, and whose turrets take just as long to be reloaded. However, strategy makes this game hard to put down. Where the console experience of World of Tanks offered in-depth and thorough training videos and forums, WOT Blitz offers in-game hints and guides that are equally detailed and beautifully sparing. Pre-game tutorials prompt players to complete basic tasks and objectives, reaching checkpoints before players can head to the garage and select/build a tank. The in-game tutorials in WOTs explain the tech tree, upgrades, XP, in-app purchases, and the tanks themselves. The garage, the battle areas, the tanks and the menus are all beautiful in this mobile port. There are 4 different tank classes to unlock in the game’s tech tree: light, medium, heavy and tank destroyers. Players will go head to head with other teams in 7V7 PvP online multiplayer gameplay in 8 unique battle arenas that are all influenced by real life locations. Maneuvering the cumbersome, boxy tanks is also probably pretty true-to-life; in-game physics impressed me on the console, and they seemed just as spot-on in the port. Using intuitive controllers, players command the camera by swiping along the right hand side of the screen. The joystick is to a players bottom left, and is also pretty responsive. (I say “pretty responsive” because I had some trouble, but I imagine that that had to do with my internet connection at the time. I had to restart the app more than once however, because I had lodged myself somehow in the environment, and my controls wouldn’t let me out. I was hoping the game would take me right back to the battle. Alas, I found myself in the garage with my tank presumably getting rocked back on the grassy knoll upon which it was left.) Overall, controls are pretty predictable, straightforward and simple to learn, which I appreciate in a mobile app. 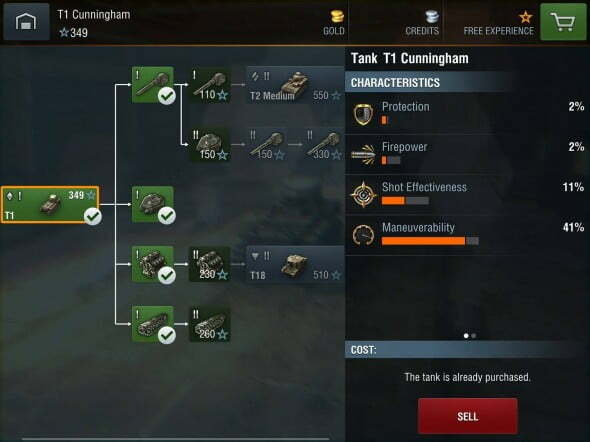 In the garage, upgrades can be applied to tanks, players can select a back-up vehicle if another tank is stuck in battle limbo, and peruse the tech tree to plot their next big purchase. Environments were relatively vast in the Xbox release of World of Tanks, and I was happy to see that this was also true of the mobile version. Visuals and sounds were rendered as if this app should cost $4.99 or higher. (I play and have made in-app purchases for Injustice: Gods Among Us, and I personally think that World of Tanks is at or damn near at that level of development.) Graphics are crisp and smooth, and the small size of the screen is compensated for by the ease-of-use for the iOS touchscreen controls. Players can communicate by just texting in-app–messages, as far as I can tell,can be read by all members of a player’s same team. When team tanks move as a unit, individuals are much much harder to pick off. The team that stays together, more often than not, seems to win. Some players have the strategy behind winning down, and they are more than happy to assume leadership roles. Sometimes, they are giant asshats about it; sometimes they’re super helpful. If you’re the type of person who is not into some random trying to tell you how to play, I would ignore the text stream completely. If you are this asshat, thank you for your devotion to learning how to blow up imaginary tanks in an imaginary battle better than other people blowing up imaginary tanks in an imaginary battle; your tireless devotion to victory has been duly noted. Please remember, though, that it’s just a game. (I saw the MEANEST exchange between a guy who was really good and one who thought he was really good during one recent mobile match…it was pretty intense. Pretty lewd. Things were said about mothers that can never be unsaid. For the most part, everyone’s cool…but still…) Players can also invite their friends to play with them online, which is always a plus. 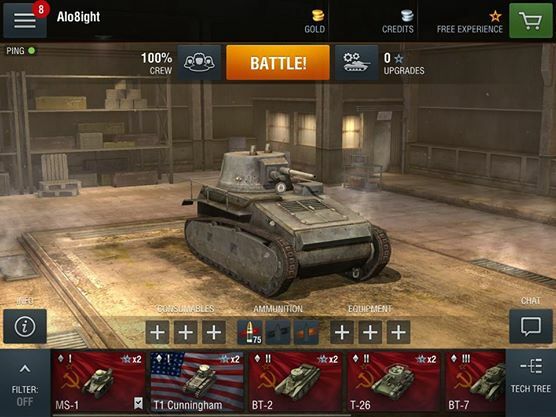 World of Tanks is free to play, but there are a lot of in-app purchase options. There are over 90 different tanks to be earned in this mobile offering, representing three countries (USA, USSR and Germany). Each garage holds six slots, but more can be purchased. but upgrading with XP can definitely take awhile. XP comes in two types: free XP and tank XP. Tank XP is earned by playing a tank in maps that can only be used for THAT same tank. Free XP can be used towards any tank, and the more XP you gain, the more versatile the matches; there are more tanks of different styles, and you face more enemies (backed by a larger team of your own) the more XP you earn. Silver is also earned during play, and accrues for frags, team matches, and just getting out there in general. And then there’s gold. Gold is worth more; gold can buy you more silver, or premium features such as whole tanks, sweet weapons and camo upgrades, and more slots in your garage to help you build an armada. Gold, however, is all on you—you earn gold by paying cash monies that are equivalent to larger hypothetical game sums. Typically speaking, I live and die by the credo of “why buy the cow”, so I love free games. Especially games like World of Tanks that are visually complex, engaging and offer so many customizable features. However, there was something really cool about upgrading to premium: exponential experience points. By purchasing a premium package (I went with premium for 30 days), I gained about 2,000-3,000 more XP per match than other players, making it a lucrative advantage in gaining XP and, ultimately, tanks. Bigger and badder tanks than a lot of the players online, which is the fun end of any stick. For a game with so much replay value, IAP on World of Tanks seemed like money well spent. I was really excited to see that, just like it's free-to-play big brother, this iOS adaptation of a popular FPS was both free and above par. Just as in the console version, the tanks turned molasses slow; this should have pissed me off, but in WOT, it's really all part of the game's charm. You plug along at this predictable, easy to plot course...and so does the opposition. This means that players have to use their surroundings, environment, map, wits, and team to protect their tanks and their bases. World of Tanks is a win/win because, even if you download the 701 MB game and hate it, it's free! If you're looking for a new favorite game for your mobile device, my money says that World of Tanks is it. Mariah lives in Seattle, and is really 3 midgets inside a lady suit. Make sure you that you are cool spending a lot of money on this game before you start.